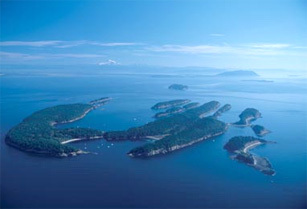 Your cruise in the San Juan Islands will reward you with scenery unlike anything you have encountered before. You are likely to see Bald Eagles, foxes, pygmy deer, otters, Dall's porpoises, seals and of course the magnificent Orcas. Your heart will race as a six foot dorsal fin suddenly breaks the water several feet from your boat, to your amazement you see an entire pod of Orcas, what a thrill. You will not want to miss Friday harbor or Roche Harbor and take the time to get to some of the less frequently visited islands such as Sucia and Matia. The San Juan's are a perfect place to relax and enjoy a more relaxed pace. There are hundreds of islands to choose from and all boast an abundance of seafood. Dungeness Crabs, mussels, clams, and Pacific salmon. Your SHYC yacht is equipped with everything you need to cook these treats to perfection. Imagine being seated in the cockpit of your yacht watching the wildlife, cradled among mountain peaks partaking of your "catch". What a life! 10,000 Years ago a glacier roamed the region known today as the Pacific Northwest. When this glacier receded it left behind the most beautifully sculpted cruising ground in the world, the San Juan Islands. Complete with 172 islands, seals, porpoises, Orca whales and breathtaking scenery, the San Juan Islands offer enough exploration to satisfy your adventuresome spirit for years. Whether you want an elegant meal at the exclusive Rosario Resort, a hike on a primitive island or just a place to relax and enjoy your favorite book, the San Juan Islands will fulfill your greatest wish with the assistance of a Ship Harbor Yacht. Day 3 - Friday Harbor to Victoria, 24 miles - Ranked as one of the best cities to live in North America. The public moorage puts you right downtown in this spectacular city. You can clear customs in Victoria. Day 4 - Victoria to Roche Harbor, 20 miles - Originally a Hudson's Bay Company trading post, today Roche Harbor is a scenic resort. You won't want to miss the famous sunset flag ceremony. Day 5 - Roche Harbor to Sucia Island, 18 miles -The #1 state park in the San Juans. Sucia is a magical island with numerous bays to explore, either by dinghy or foot. Day 6 - Sucia Island to Rosario Resorts, 18 miles - Nestled at the base of Mt. Constitution is Rosario Resort. This restored mansion offers rugged scenery, fine dining and a hot relaxing spa. Day 7 - Rosario Resort to Ship Harbor Yacht Charters, 14 miles - Rise & shine! Enjoy an early morning cruise back to Skyline Marina.